I'll dispense with the standard Me-262 history as most of us know it well. 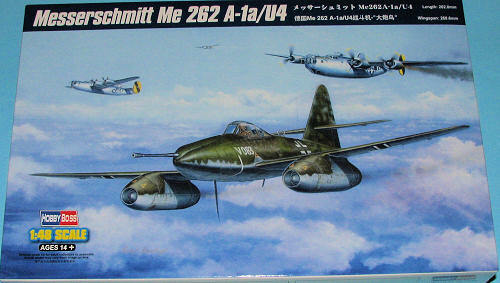 The Me-262A-1a/U4 was the result of an armaments conference of 9 February 1944 that recommended installing a large calibre weapon in the new jet. Both a long range, but slow firing 50mm Mk 214 and a shorter range but faster firing 55mm Mk 112 gun was proposed. Development crawled along. In January of 1945, Hitler and Goering held a meeting to discuss air armament. It was decided to fit the 50mm Mk 214 gun to the two aircraft. In mid February of 1945 the go-ahead was given and work was quickly undertaken in early March. 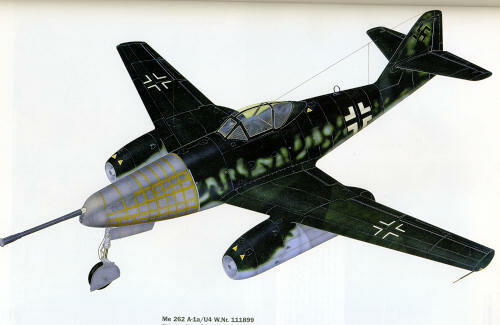 Me-262A-1a, serial number 111899 was the first prototype. Messerschmitt's test pilot made 19 flights in this plane, firing many rounds at the ground and into the air during these flights. The plane was then turned over to JV-44 where it was flown by night fighter ace Major Wilhelm Herget. It was flown in two operational missions against US bomber formations on 16 April. On both occasions, the gun jammed. The second prototype, 170083, the subject of this kit, was fitted with the gun in April of 1945. It is doubtful if the aircraft was actually flown with this gun before it was captured by US troops at Lechfeld in May of 1945. This aircraft was taken over by Watson's Wizzers before eventually being turned over to the French. The aircraft was destroyed in a crash soon after. Many were wondering how long it would take to 'downsize' the Trumpeter 1/32 Me-262 into 148 scale, and that has finally happened. For those keeping track, this is the fifth Me-262 line to be done in this scale. Starting with the Lindberg kit, moving to the Monogram version, with which modelers were quite satisfied for decades, then to the Dragon line and finally the Tamiya kits. Each of them have shown an improvement in the quality of the mold and the amount of detail. Now Hobby Boss has stepped into the fray. 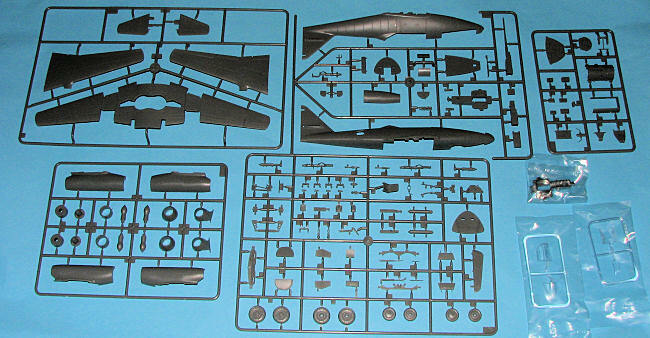 The kit's composed of five grey sprues, two clear ones and a metal nose gear bay. This latter item saves us from trying to figure out how to put in nose weight. A plastic one is also included if you want to use it, though I don't know why you would. Molding is really superbly done with fine engraved detailing as you can see from the image. You get a full cockpit tub complete with stick, seat, instrument panels and a bevy of other bits. 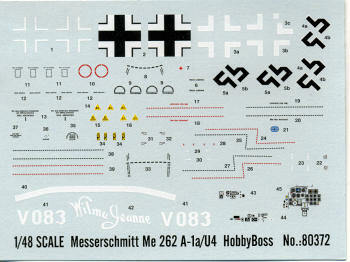 The kit includes decals for the instrument panels and side consoles. There is also raised detailing in these areas, though the main panel only shows gauge blanks with no detail. There is detailing on the underside of the tub as this is quite visible through the wheel wells. An item new to this kit is that there is a fully detailed radio compartment. A panel on the rear of the fuselage is open so that you can see the many bits and pieces that will be put in here. This also includes the oxygen generation system as well as the radios. A real plus on this kit is that the two fuselage halves are molded with the elongated nose. I appreciate this as it means one more major seam I don't have to worry about. There is a full gun to insert in the nose as well as a gun cover so you can see the gun inside. There are many photos taken of V 083 that show this feature so it is accurate. Two different styles of nose wheel are provided. One with a tire that has horizontal ribs and the other relatively smooth. Clear bits are well done with the windscreen including a bit of the forward fuselage to make it easier to fair in place. A separate bullet proof glass is included to go behind it. A pair of JATO bottles are also included. Instructions are very nicely done with six construction steps. Gunze and RLM paint info is provided during the construction steps and a list of unused parts is provided. 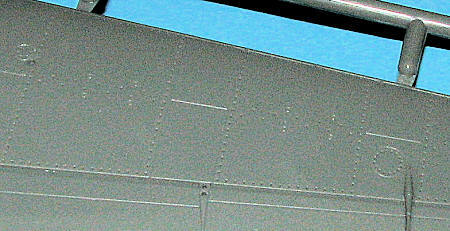 Markings are for the lone aircraft shown on the box art. The colors are RLM 83 Dark Green over RLM 76 Light blue. The reference calls for the upper color to be RLM 81 so you have a choice. Decals are well done and offer the name painted on the nose by Watson's Wizzers if one so wishes to do that scheme. I'm not sure why two sets of swastikas are provided, but you get those and a full stencil suite. The painting and markings guide is in full color with a variety of paint brand references. For those who may want to do 899 that was actually used operationally, I've included a color drawing from the reference book for guidance in painting. It will be interesting to see how this one stacks up to the Tamiya kit, the current detail leader. The addition of the radio compartment stuff ups the detail ante another notch. How the Hobby Boss engineering will compare can only be determined by building it.